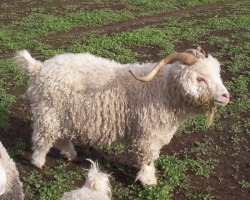 Our current herdsire is Phezulu Traveller (sired by Phezulu Bentley). We are very impressed with the superfine kids produced by this buck. Traveller is himself an extremely fine buck, testing at 24 microns on his fourth fleece. Other buck influences include Sunnyridge Supreme, Sunnyridge CurleyBoy, Phezulu Heath and Vagabond Xavier. Traveller is an exciting young buck who has been doing a wonderful job in our herd; although he is not much to look at himself, his kids are taking the show ring by storm. Traveller is from a very strong maternal line, and it shows - his doe kids are fantastic. 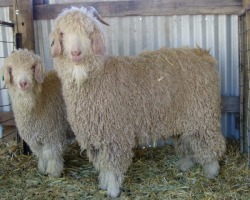 He has a very dense, super styled, fine fleece measuring 24 micron at the third, fourth and fifth fleece. 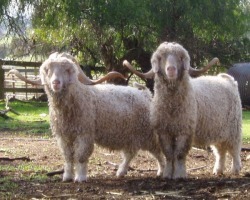 His kids have inherited his fantastic fleece. 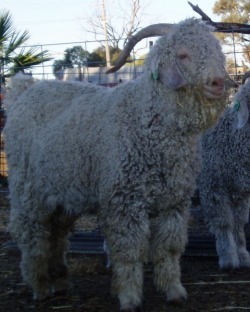 Heath was bought as an outcross buck, in order to gain genetics from the Mallee Park herd. He is a big, solid buck with great body and conformation. He also has heavy, even and super styled fleeces, and although not superfine, he is within the fineness parameters I have set. We are expecting Heath's first kids in August 2009. Supreme is a buck who has sired hundreds of show winning and paddock performing goats. A top quality buck, who sadly passed in 2008. We are very fortunate to have his genetics in our herd through his daughters. Supreme is pictured on the left. Reference sire. CurleyBoy is superb buck who has been the main herdsire in Daryl Finch's acclaimed Sunnyridge stud for many years. This buck consistently throws high quality, show winning kids. CurleyBoy is pictured on the right, next to his sire Supreme. Reference sire. Reference sire. Sire of many of our commercial does. A large framed buck with plenty of fleece.